The practice of receiving details about one’s eternal, spiritual body or siddha deha i.e. siddha pranali from the spiritual master began 500 years ago in the beginning of the Gaudiya Vaisnava sampradaya. 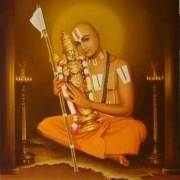 Sri Visvanatha Cakravartipada also accepted siddha-pranali from his Guru. In his book, “Sankalpa Kalpadruma”, Cakravartipada mentions the siddha dehas of his Guru and the other members of his lineage as Tulasi-manjari, Ranga-manjari and Prema-manjari. The three most prominent acarya Gurus in the parampara of IGM (Iskcon/Gaudiya Math)—Jagannatha das Babaji, Sri Gaura Kishora das Babaji, Srila Bhaktivinoda Thakura, and also Sri Vamsi das Babaji—ALL RECEIVED SIDDHA PRANALI from their Gurus. In fact, Srila Bhaktivinoda Thakura fully endorsed the system of siddha pranali diksa. He gave it to his youngest son, Sri Lalita Prasada Thakura, who in turn gave it to several western disciples of Srila Prabhupada. Srila Bhaktivinoda Thakura clearly describes the practice of receiving siddha pranali diksa from Guru in three of his most famous books, “Harinama Cintamani”, “Jaiva Dharma, and Gitavali, which are very popular with members of IGM. So how can anyone say receiving siddha pranali from one’s Guru is “bogus” “unauthorized” or “a practice of sahajiyas”? The phrase siddha-pranali means “siddha” i.e. the spiritual body or siddha deha, and “pranali” means a lineage, channel or line. Siddha-pranali means the line or list of the Gurus in one’s lineage, along with their siddha dehas in Radha-Krishna’s eternal pastimes in Goloka Vrndavana, beginning with the patriarch or founder of one’s individual parivara, which means family or branch of the Gaudiya Vaisnava sampradaya like Nityananda Parivara, Advaita Parivara, Gadadhara Parivara, Lokanatha (Narottama), Syamananda etc. For example, in Krishna lila, Sri Nityananda Prabhu’s eternal transcendental form is Srimati Ananga Manjari, the younger sister of Srimati Radharani. Srila Bhaktivinoda Thakura is Kamala Manjari. In a letter to a disciple, Srila Bhaktisiddhanta Sarasvati Thakura said his manjari siddha deha name in Krishna lila is Nayana-mani manjari. In the siddha-pranali system, the Guru privately tells a qualified disciple the 11 aspects of his siddha deha known as ekadasa-bhava, which include the disciple’s eternal spiritual name in Krishna lila, age, dress, seva, kunja, mood, sakhi group leader like Laltia or Visakha, and so on. As learned from his own Guru, Sri Guru then teaches the disciple the same method to realize his/her eternal spiritual identity, siddha deha. One’s pranali includes the siddha deha identities of each Guru in one’s individual parivara. The disciple then meditates on one’s own and their forms while mentally serving Radha-Krishna’s eternal asta-kaliya-lilas in Vraja Dhama. However, if one examines all the evidence given above, one might wonder who are these “sahajiyas” that Srila Prabhupada is talking about? Surely, it can’t mean Srila Bhaktivinoda Thakura, Sri Visvanatha Cakravartipada or any of the famous Gaudiya Vaisnava acaryas mentioned above. In fact, the following conversation downloaded from I-net seems to prove that Srila Prabhupada actually approved of the siddha-pranali system, wherein the Guru gives the siddha deha to a qualified disciple. In 1974, Mayapur ISKCON, Srila Prabhupada had the following most revealing talk with Sri Hrishikesananda das, a scholarly disciple of his who studied Gaudiya Vaisnavism in Vrndavana in the 70s. Today, he lives in Thailand sincerely practicing Krishna consciousness, and lovingly caring for his devotee family. Srila Prabhupada: What you have learned in Vrndavana? 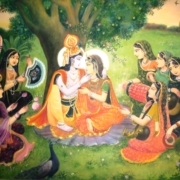 Hrishikesananda das: Gurudeva, I learned about Krishna’s nitya Vraja lila, siddha-pranali, and asta-kaliya-lila smaranam. Is this alright, Gurudeva? Srila Prabhupada: YES, but who is siddha? HD: So, Srila Prabhupada, what about siddha-pranali? How to qualify? Who will give it? Srila Prabhupada: GURU WILL GIVE [siddha-pranali]. You just chant Hare Krishna. HD: So how will your disciples receive this eternal information, Gurudeva? Srila Prabhupada: [repeats] GURU WILL GIVE! There is no material consideration about whether one’s Guru is here or there [in the spiritual sky]. When you reach that level, GURU WILL GIVE. HD: Gurudeva, manasi-seva, mentally meditating on serving Krishna, is this also bhakti bhajan? Srila Prabhupada: Krishna makes no distinction [whether you serve in your mind or with your body]. But if you serve Krishna by mind—He will accept. That is sure! HD: Gurudev, whenever I mention anything about these things to my God brothers, they get angry and say that you never taught that! Srila Prabhupada: [That’s ok] Everything is coming; they will also know it. So this is the exact and clear truth about the siddha-pranali process along with supporting facts describing its origin, authenticity and acceptance by all the leading mahajanas of the Gaudiya Vaisnava sampradaya beginning with Sri Caitanya Mahaprabhu’s eternal associates, the six Gosvamis and contempory Gurus like Srila Bhaktivinoda Thakura and Srila Prabhupada. It is hoped that this knowledge will enlighten everyone regarding the truth about siddha-pranali. Henceforward, may no one malign those sincere devotees practicing this traditional method of sadhana bhajan. It is certainly unbecoming, unfair, immature, and offensive to wrongly tag or label sincere devotees as “sahajiyas” or “bogus” for following a completely bonafide system of spiritual advancement within the Gaudiya Vaisnava sampradaya. Gaudiya Vaisnava harmony ki jai! Jai Jai Sri Radhe!